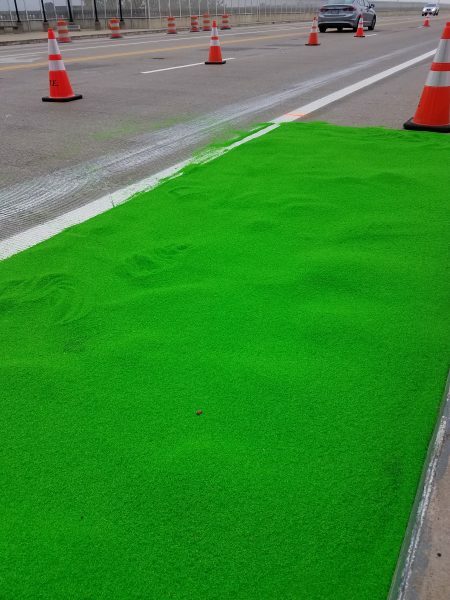 It’s November 1st, and the very first phases of green “paint” are being applied to the Detroit-Superior bike lanes. But to call this stuff paint is an understatement. 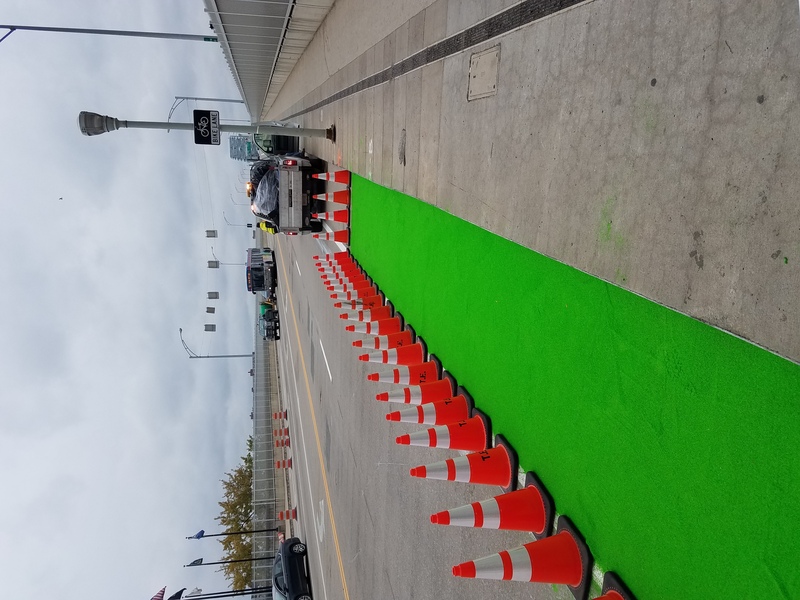 Representatives from Sherwin-Williams, City of Cleveland Traffic Engineer Andrew Cross, and a large crew of workers were out in force during this initial application & training session of what will hopefully become a more standard practice around town. Thanks go out to them for giving me (and therefore YOU) a run down on the details. Here’s how it works. A layer of tough epoxy adhesive is applied to the concrete across the area to be covered, with adjacent areas masked off to form a border. 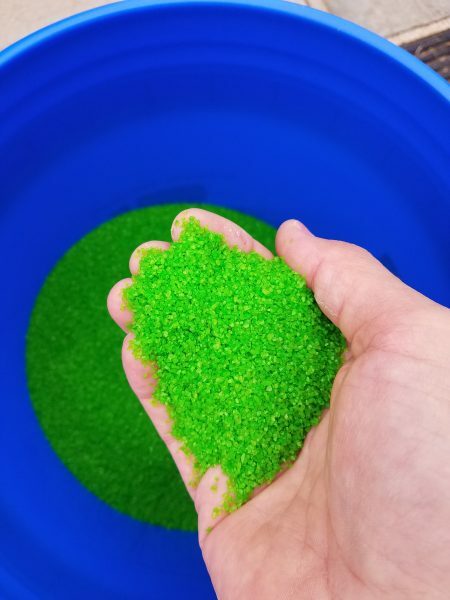 Then, the green layer is applied on top of the adhesive. This layer is actually recycled glass! Don’t worry. It’s been tumbled and there are no sharp edges to give you flats, etc. But it is extremely durable and will provide traction during wet weather due to the sandpaper-like final product. It gets sprinkled in a thick layer over the adhesive. 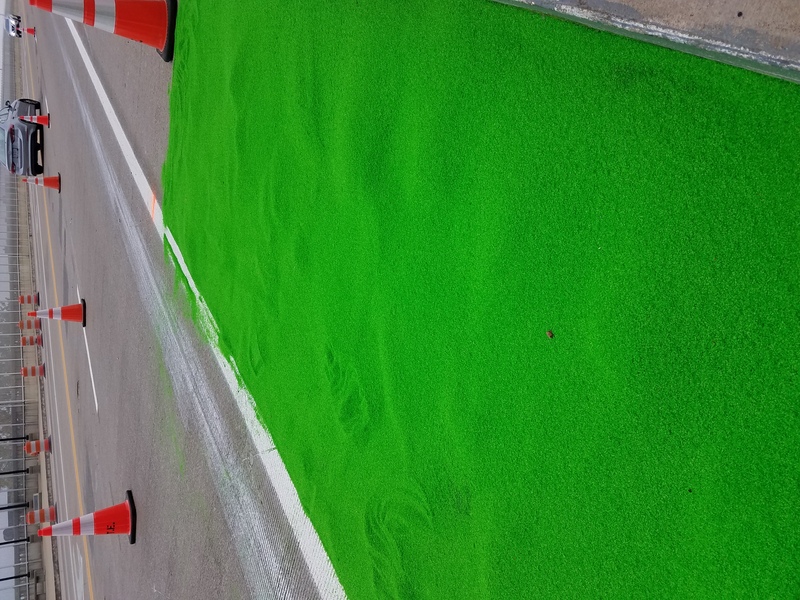 Once the adhesive cures, the excess surface material is swept away, laving behind a tough green layer on the roadway. The glass actually reflects a bit of light, and is very bright – even in today’s very limited light. 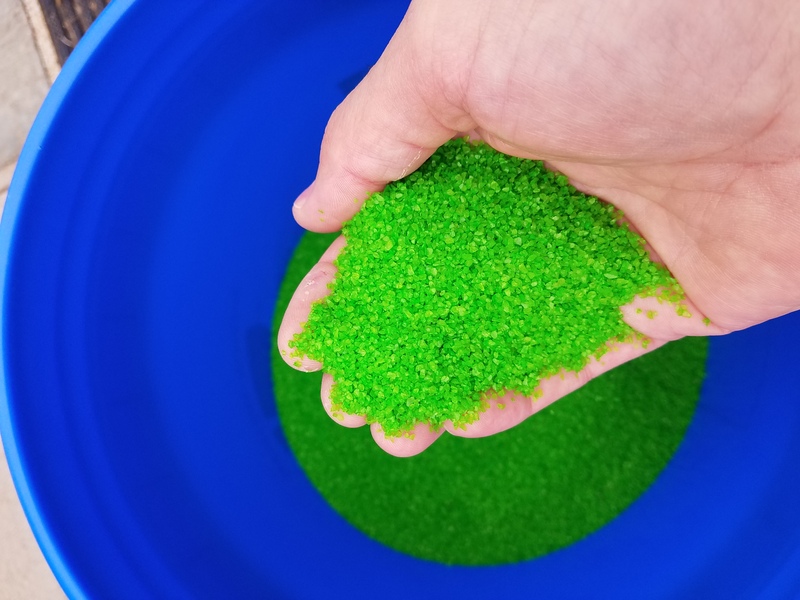 The swept-off material isn’t wasted, it gets added back into the stock and used in another section. This process is new in the City of Cleveland, but it’s not new. It’s been in regular use on roads in other cities for some time. At least 1 more pass with the brooms still to go. Here’s the bummer: the cold and wet weather that is upon us will definitely slow the installation of this feature. The ground at the ends of the bridge is just warm enough for install, but the span – which is exposed to cold air on both sides – is too cold to apply the adhesive. 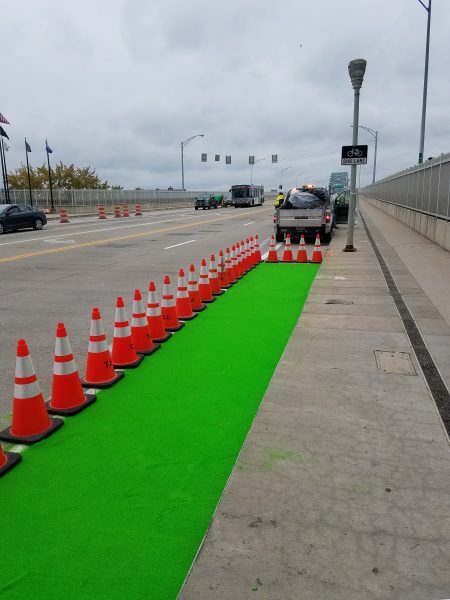 Not a huge deal, because the bike lanes are already there. And in the end, a successful and durable installation is desired above all else. Hopefully another warm spell comes our way and they can get out there and get some more done. Patience please with Mother Nature!